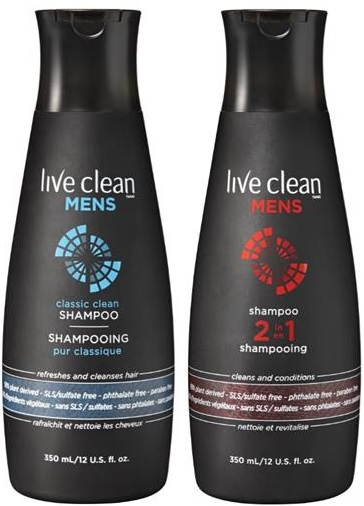 Great looking hair for him thanks to Live Clean, Marc Anthony and L'Oréal! Live Clean Mens Classic Clean Shampoo - 350ml - $6.99 and Live Clean Mens 2 in 1 Shampoo - 350ml - $6.99 - cleans while adding just the right amount of conditioner to control hair and keep it looking great all day long. Both 98% plant derived products are free of all harsh chemicals and designed to cleanse, moisturize and condition the scalp and leave his hair smelling great thanks to Power Tech3 - a blend of organic tea tree oil, organic peppermint oil and organic jojoba oil. Available now at Walmart, Safeway, Amazon and well.ca. 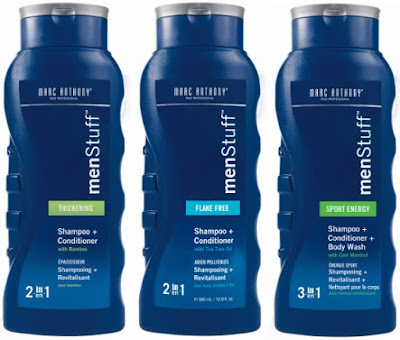 Marc Anthony menStuff Thickening 2-in-1 Shampoo & Conditioner with Bamboo - 380ml - $7.99 - for strong, thick, full looking hair. Marc Anthony menStuff Flake Free 2-in-1 Shampoo & Conditioner with Tea Tree Oil - 380ml - $7.99 - hair and scalp are left healthy and clean. Marc Anthony menStuff Sport Energy 3-in-1 Shampoo, Conditioner & Body Wash with Cool Menthol - 380ml - $7.99 - to start the day fresh and clean from head to toe. All offer a simple and easy way to deeply cleanse with a fresh invigorating scent, while moisturizing and conditioning to leave hair and skin feeling clean and refreshed throughout the day. Available now at drug and mass retailers including Walmart across Canada. L'Oréal Men Expert Arginine Resist x3 2 in 1 Reinforcing Shampoo & Conditioner - 385ml - $5.99 - features an energizing formula great for fragile hair with a tendency to fall out. With a triple action formula that nourishes the root; strengthens hair; and restructures hair from root to tip - for hair that is stronger and more resistant so falls out less. Enriched with two key ingredients: arginine - essential for hair growth and helps strengthen hair fibers from root to tip; and taurine - energizes hair to stimulate micro-circulation.